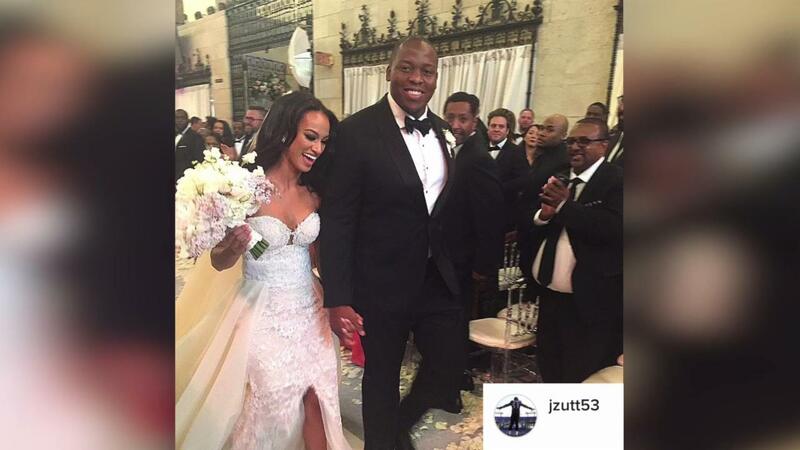 Baltimore Ravens center Jeremy Zuttah and Heran Haile considered getting married at City Hall. Then they found out their Pit Bull Ace couldn't be a witness at that venue. "So that didn't work," says Heran. Instead, in early June, the two had a fabulously wonderful fancy wedding at a converted gym. The bride wore a stunning dress. The groom wore a trim tuxedo. And so did Ace, who walked down the aisle as a groomsman. Ace came into the picture while Jeremy and Heran were students at Rutgers. He was part of an unexpected litter born to a friend's dog — "a love child," as Heran puts it. At the time, Heran wasn't a Pit Bull person. She'd recommended that Ace be traded in for a Yorkie, in fact. That's obviously changed, in the eight-some years since. Now, she and Jeremy are both strong advocates for pet adoption, and for animals to be spayed and neutered. They're big time Pit advocates now, too — Jeremy spends his off-time on Facebook telling folks to "adopt not shop, bro," and Heran dreams of devoting herself to rescue. They take credit for putting a bug in the ear of Jeremy's teammate Ronnie Stanley, who walked into Baltimore's city shelter a month ago and asked to adopt a dog who'd been there for a long time. "We're crazy dog people," Heran says. Jeremy may be the Ravens' center, but Ace is used to being the center of attention. Last week, Heran and Jeremy bought their boy a cake from a local dog bakery for his 8th birthday. He regularly struts around Baltimore while adoring fans – Ace's, not Jeremy's – tell the pup how how good-looking he is. "He knows the word 'handsome,'" Heran says. In fact, Kevin Spacey spotted Ace walking down the street while he — Spacey — was in town shooting House of Cards. He got down on the ground while asking "Who is this handsome boy?,"and practically "started making out with Ace," Heran says. Ace did great at the wedding. Like brides and grooms take dance lessons before getting hitched, Ace had a couple of sessions with a trainer, to help him keep his cool (and not turn into a dingus) while walking down the aisle. It was only when Heran made her entrance, and made eye contact with Ace, that he started yelping and trying to get to his mom. They shared an emotional moment on a beautiful day. With that, it was exactly the wedding she and Jeremy had dreamed of. "Ace has changed my life," says Heran. "Honestly, all I want to do is win the Powerball and free all the dogs." The post NFL Player Wouldn't Get Married Unless His Pit Bull Walked Down The Aisle appeared first on BarkPost.